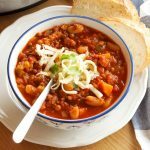 This Vegetarian Chili is easy to make in the Crock Pot or slow cooker. It's high in protein and low in fat! Add the tomatoes, lentils, white beans, carrots, celery, onions, garlic, and spices to the pot of your Crock Pot or slow cooker. Add the vegetable stock and stir well. Cover, and cook on high for 3 hours or on low for 5-6 hours. Serve while hot with some shredded cheese and chopped cilantro for garnish (optional), and a slice of fresh bread. - Store any leftover chili in the fridge for 2 days or in the freezer for up to one month. - Depending on the water content of the vegetables you use, feel free to add a little bit more or less vegetable stock to achieve the consistency you desire.